We estimate that the uprating measures in 2013-14, 2014-15 and 2015-16 will result in around an extra 200,000 children being deemed by this measure to be in relative income poverty compared to uprating benefits by CPI. The Government strongly believes looking at relative income in isolation is not a helpful measure to track progress towards our target of eradicating child poverty..The Government is currently consulting on better measures of child poverty that will better reflect the reality of child poverty in the UK today. However, it’s sometimes surprising what people give away without meaning to when they’re trying to be clever. In her attempt to dismiss the significance of the impact of yet another destructive coalition measure, rather than justifying herself and her government, Ms McVey inadvertently damned her government and revealed that the true impact of the coalition government on ordinary people has been worse than she was trying to make it appear. In times of economic growth, the relative poverty line tends to rise. While the economy grew from 2003-04 to 2008-09, the Government spent over £300 billion in working-age welfare and tax credits, yet the proportion of the population in relative income poverty remained broadly flat..In times of recession the relative poverty line tends to fall. In 2010-11, 300,000 children moved out of relative poverty largely due to reductions in median incomes. In other words, because relative poverty is defined as anything less than 60% of the nation’s median income, when the median income rises, the threshold for relative poverty rises too; when it falls. the relative poverty line falls too, and a certain level of income might be above the line in recession but below it in a strong economy. How does this damn the Tory-led government? Simple. McVey just admitted that there are 300,000 children who are currently not counted as being in poverty just because we’re in a recession. Around 3.6 million children in the UK are officially living in poverty – a scandal in one of the world’s richest nations. But Ms McVey admitted that there will be another 200,000 by 2015 – and that the 3.6 million figure should already read 3.9 million. In fact, since the economy has fallen even further since the 2010-11 period, Ms McVey’s 300,000 probably means 500,000 or more. But let’s be cautious for now and assume her figure is correct. So, taking Ms McVey’s 200,000, plus the 300,000 she says are in poverty but not measured as such because of the recession, we have an additional 500,000 children in poverty even by the most cautious calculation, either because of the 1% benefits cap or because they’re simply not recorded for technical reasons. Unfortunately, we’re nowhere near done yet. First of all, the Institute for Fiscal Studies (IFS) has calculated that 800,000 children will also enter poverty by 2020 because of the government’s squeeze on tax credits and benefits, and the impact of universal credit. These 800,000 children are in addition to Ms McVey’s calculations. Let’s be very generous to the Tories and assume that all the 300,000 children who are currently not technically in poverty for technical reasons will be among these 800,000. That still adds 500,000 children – individual, vulnerable children, not merely a statistic – to our total. We’re still not done. As I pointed out last year, the change from Disability Allowance (DLA) to Personal Independence Payments (PIP) will push between 85,000 (in an extremely unlikely ‘best case’ scenario) and several hundred thousand disabled people below the poverty line. Since we were generous to the Tories just now, we’ll be more realistic here and assume a middle-range figure for the number of disabled people pushed into poverty: 200,000. Assuming only half of them have children (again, being very cautious – I can’t bring myself to be ‘conservative’ just now), and that those who do have children have only 2, that brings us to 200,000 more children pushed into poverty by the DLA-PIP change that have not been accounted for in any of the earlier estimates. And in fact, I’m still being too generous to the government. When I wrote the article about disabled people being pushed into poverty, I based my calculations on the stated intention of the Dept for Work and Pensions (DWP) to remove 500,000 people from disability benefits. But Ms McVey’s statement to the House last month revealed that the government is expecting to remove a far higher percentage of disabled people from benefit eligibility. If that percentage is maintained throughout the reassessment of all 3.2 million benefit claimants, it will mean up to 1.9 million disabled people having their benefits cut off or seriously reduced instead of 500,000 – and the number of child dependents affected will be commensurately higher. But let’s stick with the lower figure for now so that no one can accuse us of exaggerating the scale of the disaster. 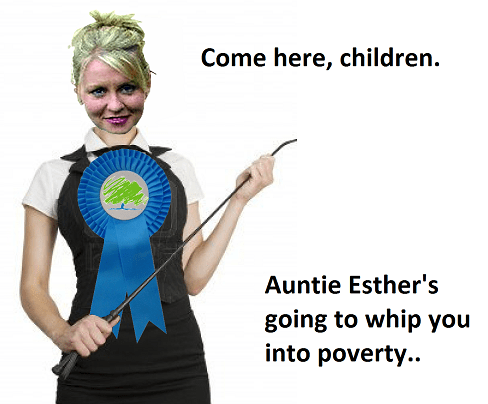 So, while Esther McVey was eventually forced to admit to 200,000 more children being forced into poverty by the government’s latest measure, we can see that she was being far too ‘conservative’. The real figure is (at least, and I’ve been very cautious with my figures) 1,200,000. That’s one million, two hundred thousand. By a government led by a party that would like to think of itself as the party of family values. Ms McVey tried to be clever, and inadvertently added damning evidence to the massive tally already stacked against this heartless government. A government which masquerades as standing for fairness, for ‘doing the right thing’ and for protecting the vulnerable. It is not. It never has been, and it most definitely is not now. It is the party that protects the wealthy at the expense of the vulnerable and the dispensable. Reblogged this on A4E Petition.